U.S. and Russian officials have been trading accusations that each side bombed a massive UN aid convoy that was traveling to the war-ravaged city of Aleppo in Syria. Late last week, the Russians backed up their charges by releasing drone video that showed militants in a pickup truck with a mortar stalking the convoy shortly before the attack. Last week, Secretary of State John Kerry and Russian Foreign Minister Sergey Lavrov made fiery speeches before the UN General Assembly, accusing each other’s country of violating the ceasefire in Syria by continuing to bomb targets in Syria. One of the cases of this involved an attack on a UN aid convoy near Aleppo that resulted in the death of 20 civilians and one UN aid worker. U.S. officials, citing no evidence, claimed the Russians had mistakenly bombed the aid caravan. The Russians countered late last week by releasing video shot from one of its drones that showed a pickup truck driven by rebels, which was carrying a large mortar. The assumption is that these are rebels backed by the U.S., who have been armed and supplied by Arab countries and the West to take down the government of Bashar al-Assad. The photo still above, taken from video shot by a Russian drone that was escorting the convoy, is highlighted to show the UN trucks along with the militant’s pickup truck shadowing it just to the left. Witnesses say that the convoy was hit at least 20 times. If it turns out that the U.S. government is lying, this is truly frightening. Are U.S.-backed rebels trying to force the United States into not only a no-win war with Russia but one that the U.S. might actually lose? The importance of this story cannot be overestimated, and we will be keeping our eyes on it. 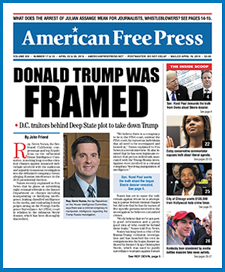 Christopher J. Petherick is the editor-in-chief of AMERICAN FREE PRESS and lives in Washington, D.C. If the US keeps playing with Russia like this they will get the same treatment that ALL other countries have had down through the ages. The Russians won’t stop.